Christmas is tricky. Andy and I always struggle to buy each other Christmas presents. While Master 4 has a never ending list of Lego that “we need to buy” we are far trickier customers. Obviously, anything food and wine oriented goes down a treat with me … so in the past I have received things like black lentils, szechuan peppercorns or molecular gastronomy chemicals. And wine. And maybe some more wine. The Christmas just gone we were faced with the usual dilemma. Andy decided he wanted a PVR but that we should wait for the post Christmas sales (no present bought as yet … this is going to go the same way as the ladder a few years ago – which was bought in April). After some thinking I announced that I wanted either a madeleine pan or a friand pan. I showed Andy pictures of what I meant (he’s not quite as well versed in cake as I am) and on Christmas morning I scored both. They were both Bakers Secret – a brand which I’ve used a couple of times before and been impressed with. I bought my dad a pile of their pie tins and they’re excellent. They’re non stick but they’re very sturdy and robust, with a good weight to them. The non stick surface seems to be of a good quality too – which is what you’d expect if you’re going to the bother of making a good pan/tray in the first place. A quick survey of recipes showed that I could make use of my madeleine pan immediately, so once present opening was done and Andy and Master 4 were busy building the Lego-robot-monster, I nipped out to the kitchen to check my supply of almond meal and try out this easy madeleine recipe. This is a super fast, easy, and apparently foolproof recipe. I’ve made it a couple of times (madeleines are going to be my new “I-need-cake-in-a-hurry” thing) and messed around with flavourings. On one occasion I subbed honey for the almond essence but the flavour didn’t really come through and the edges of the madeleines caught with the extra sugar so that’s going to need a bit of tweaking. What I love about these little cake-biscuit hybrids is, not only are they quick, but they are small. I complain a great deal about the ridiculous size of cakes and biscuits in cafés. These are the perfect size for an afternoon tea snack without spoiling your appetite for dinner. Note that putting the madeleines in the freezer before cooking is (supposedly) what gives rise to the bump. Also, I found that my oven comes up to temperature in the 10 minutes of freezer time so you may not need to turn yours on right at the start! Grease madeleine tin lightly using spray oil (a quick spray in each hole and then use your finger to ensure the spot is well greased). Whisk eggs, salt and sugar together until frothy (easiest if you have a stand mixer). Add remaining ingredients and whisk to combine. Spoon mixture into madeleine pan. Place (flat!) in freezer for 10 minutes and then transfer to oven and cook for 10 minutes. 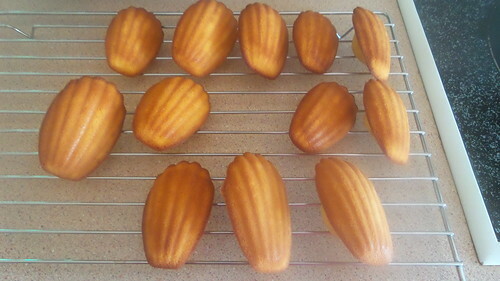 Allow madeleines to cool on rack. Serve dusted with icing sugar, if so inclined. Cup of tea or coffee essential and dunking recommended.